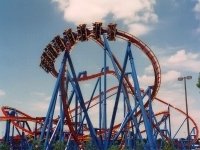 Six Flags Great Adventure is the largest theme park in New Jersey, and one of the most popular on the east coast of the US. It has eleven themed areas, with various rides and attractions for all ages, and thirteen rollercoasters. Much of the park is themed with DC superheroes like Superman, Batman, and the Green Lantern. The park has a number of restaurants, cafes, and souvenir shops. The attached Six Flags Wild Safari is a drive-through game park with lions, elephants, giraffes, kangaroos, and bears. Next door is Hurricane Harbour, a waterpark with a wave pool, an adventure river, and more than a dozen speed slides. Opening times: Hours vary according to season. Check the website for current times. Admission: Adults $76.99, children $48.99. Discounted tickets available through the website. Parking $23.99.